Solar panel installation is a significant issue in getting the maximum output from a module or a residential solar panel or a commercial solar panel. Apart from the tilt angle, the direction of the installed panel also counts in getting the most of yield. However, solar panels may also be flush mounted if so desired. Solar panels however are best installed when a home is being roofed since the rafters, against which the mounts are secured can be best located at that time. In fact, all mounts are secured with the rafters with the help of stainless steel lag bolts. Incidentally, ‘Flashed in’ structural attachment points seem to be the right choice for solar panel installation since this process lessens the cost of future re-installation of solar panels. · Use Solar Panel Mounts to structurally attach the panel to the roof. In case of new roofing, the mounts are secured before the new roof is applied while for existing roofs, different types of mounts are used. · The mounts are then aligned on top of the rafters and pre-drilled to save them from splitting. A laser sight or a chalk line may be used to keep the mounts in a straight line while the alignment work goes on. · The mounts are then secured to the roof with stainless steel lag bolts. · Metal flashings are to be placed then over the mounts and a fresh layer of roofing can be ‘hot-mopped’ around the mounts. Also, metal rails may be secured to the posts with 3/8” stainless steel bolts. · Pre-assembled and hard-wired solar panels in groups are finally installed on the mounts and securely connected to the grid via the battery bank and the installation is thereby completed. Although this is a generic type of installation of solar panels, variations are common, depending on requirements matching different states. For instance, installation of solar panels in areas where the climate is more or less temperate varies with those in the north where snow and sleet mostly rules the climate. People living in moist or rainy areas use extra mounts to protect solar panels from getting damaged by incessant rains. Learning how to install solar panels offers great advantage because you can then do it yourself. And to make this convenient, the learning is quite easy as well. 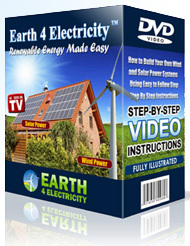 All you need is a guide that hand holds you and shows you step by step how to install solar panels and where in the home to do it, how to wire the system, where to get the batteries and the parts from cheaply and finally, the all important safety precautions. There are many reasons for going solar that include both financial (saving on electricity bills) and ecological (solar power is clean and environment friendly) – so it is the right time to opt for solar power.